Loving a dead man can be brutal. Diana Reye’s pregnancy is draining her of life. Now she and vampire Ryder Latimer are faced with the most difficult choice of all. Turn Diana, or lose her and the baby. If Ryder chooses to save them, he risks the wrath of the Slayer Council and will be marked for his own death by their friend Michaela. Chasing a vampire can be consuming. FBI agent Michaela Ramirez has been searching for the vampire who raped and killed her mother while acting as an enforcer for the Slayer Council. Since meeting FBI Director Jesus Hernandez , however, Michaela is losing a bit of her edge as she imagines the possibility of a life full of happiness and passion with her handsome boss by her side…and in her bed. Living without the one they love isn’t an option. But soon trouble comes calling as the vampire she hunts makes Michaela his prey. Now Michaela finds herself in a battle not only for her own life, but for her friends lives as well, as she and Ryder both make the difficult decision to break all the rules for love. 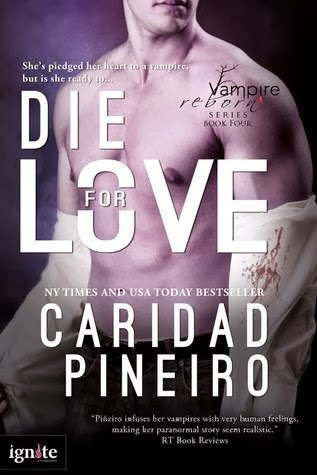 This was a great edition to another wonderful series by Caridad. The best part about it? You can pick up any of the books and feel right at home...even though you may wonder about how the couples got together, and some of the back drama, it is an amazing book to start with! This book is mainly about Michaela and Jesus. You watch how their relationship is tested in just about every way possible. The decisions Michaela is forced to make result in how the flow of their relationship, and the relationship with their friends will continue. Its not easy for Michaela because she has been alone for so long, she has no idea how to rely on someone and take others considerations before her own. She believes that friendship and love will make you weak. But she is a well of compassion.....and secretly hates killing. Such a charming contradiction our Michaela, and even though it is amazing obvious that she is totally in love with Jesus, she is struggling so hard to come to terms with it. Jesus or J as she refers to him, is a power all on his own. Totally human, but a solid support system, and all the man Michaela(and might I say any of us?) can handle. He is loyal, loving, caring, all wrapped up in a deadly exterior package. So there are a few surprises that pop up if you have read the series...quite a few actually. I truly hope that Ryder wasn't permanently damaged during his fight with the villain in this book. He seemed changed and lost in a darkness. Overall? It was an incredible adventure and I can't wait for book 5!! !